When co-workers gather for lunch, the conversation topics are endless. But lately, the conversation at the PCG lunch table has been leaning more and more often to running. (Sorry, non-runners.) That’s because two PCGers recently completed the Philadelphia Marathon! That’s right. Two of us were crazy enough to put in weeks of training to run 26.2 miles. For fun. 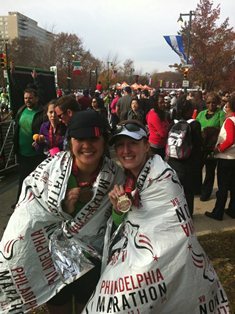 While Philly was my second marathon, it was the debut marathon for PCG Coordinator Natalie Vegel. Our mutual love for running was discovered over lunch one day. This discovery quickly revealed the coincidence that we were both registered for the Philly Marathon in November. With several friends training for fall marathons, a training group quickly formed. We were a gang of runners comprised of friends, significant others, and current and former co-workers, all with the goal of conquering 26.2 miles in various races several months down the road. Before we knew it, we were tapering (translation: no more crazy mileage) and the big day was upon us. As we nervously gathered on race morning, we marveled at the great racing weather and confirmed with each other that yes, we were really doing this. And run the marathon we did. With friends and fellow runners cheering us along the way, we crossed the finish line one by one. In one piece and with big smiles on our faces. To answer a question we've both been hearing quite a bit over the past week - yes, there are definitely more marathons in the future for both of us!